This method, including the indication to operate, will be discussed. METHODS AND PROCEDURES At first, these diseases are divided to three major categories, the Mega-colon involving only the sigmoid colon (?sigmoid colon volvulus), the extended Mega-colon involving all proximal colon, and splenic flexure type constipation. On the patients with sigmoid colon volvulus( Type? ), we have performed sigmoidectomy through a 4 cm incision ( with a laparoscope as a bach-up ). 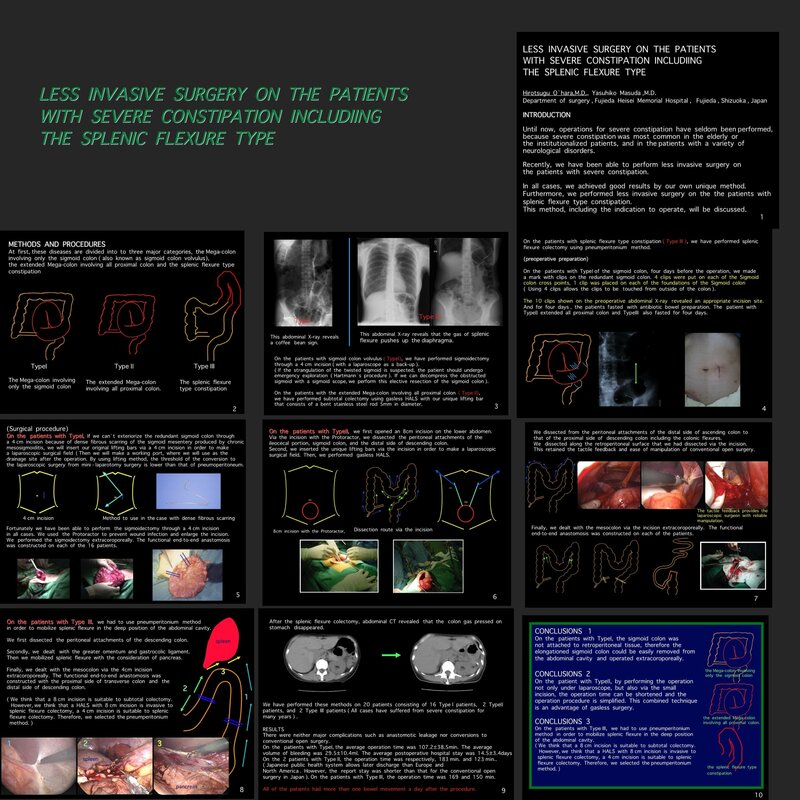 On the patients with the extended Mega-colon involving all proximal colon ( Type ? ), we have performed subtotal colectomy using gasless HALS with our unique lifting bar that consists of a bent, stainless steel rod 5mm in diameter. On the patients with splenic flexure type constipation( Type III ), we have performed splenic flexure colectomy using pneumperitonium method. We have performed these methods on 20 patients consisting of 16 Type I patients and 3 Type? patients, 1 Type III patient, after enough bowel preparation. RESULTS There are neither major complications nor conversions to conventional open surgery. All of the patients had more than one bowel movement a day with a low dose of laxatives. CONCLUSIONS On the patients with Type?, the sigmoid colon was not attached to retroperitoneal tissue, therefore the elongationed sigmoid colon could be easily removed from the abdominal cavity and operated on extracoroporeally. On the patient with Type?, by performing the operation not only under laparoscopy, but also via the small incision, the operation time can be shortened and the operation procedure is simplified. This combined technique is an advantage of gassless surgery. On the patients with TypeIII, we had to use pneumperitonium method in order to mobilize splenic flexure in the deep position of the abdominal cavity.